Students wrapped leis around their necks, searched for their loved ones, or slathered on the sunscreen. Also: They're artists, scientists, engineers, linguists, actors, and more. 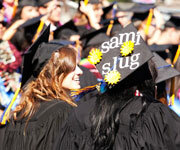 Check out our 20 Grads/20 Days web feature. Breaking science: Two big UCSC science stories received widespread media coverage last month: Ed Green's Neanderthal genome findings, and Barry Sinervo's study documenting widespread extinction of lizard populations due to climate change.